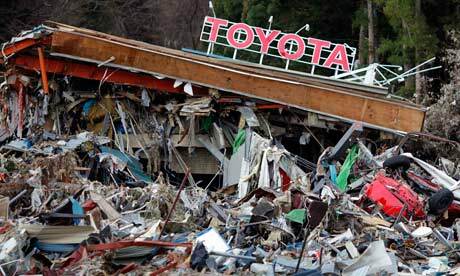 TOKYO — Toyota is stopping most of its auto production in Japan as a result of a deadly earthquake in northern Japan. Due to the interruption in its supply chain there, the automaker will idle factories beginning Saturday, the company said. Toyota will halt planned production at its Kyushu, Tahara and Toyota Auto Body plants. Those factories make Lexus vehicles and the Toyota Land Cruiser, among others, some of which are bound for the U.S. markets. Spokeswoman Akiko Kita said, starting on Monday, the shutdown will affect all Toyota and Lexus lines in Japan, except for two Daihatsu plants that also manufacture Toyota-brand vehicles. Toyota has 18 plants that produce vehicles in Japan. The company could not immediately comment on the supply chain impact on overseas operations. The earthquake struck the northernmost island of Hokkaido before dawn on Sept. 6, killing more than a dozen people and leaving the entire island without power. Authorities were slowly restoring utilities on Friday but swaths of the region remain offline. Toyota has a plant in Tomakomai, Hokkaido, that makes automatic transmissions, continuously variable transmissions and transfer cases. It was still without power on Friday night, Toyota said. A spokesman for Toyota’s North American business said the initial production halt is not likely to have much impact on North American operations. The automaker could not say when production will resume. Meanwhile, Nissan Motor Co. spokesman Koji Okuda said the company did not expect any production interruptions from the quake because it has no manufacturing facilities in Hokkaido. Nissan does have a proving ground there, however, and operations there were temporarily suspended due to the power outage.